The number 11 not only became a black date for Americans, but also for the Spanish. Many political analyses and investigations linked the Madrid attacks – on the Spanish commuter train system – with 9/11. Several Spanish and French media referred to the event as the “Spanish 9/11”. 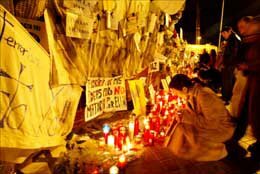 While 9/11 was the most barbaric and inhuman attack in American history since Pearl Harbor in 1941, the Madrid bombings, which killed 201 people and injured more than 1,800 were the deadliest terror attacks in Europe since the Lockerbie bombing in 1988, and the worst terrorist assault in Spanish history. Early official statements identified ETA as the prime suspect, but the group, which usually claims responsibility for its actions, denied any wrong-doing. Later evidence strongly pointed to the involvement of Al Qaeda, and accused several suspects of Moroccan origin. Two million Madrileños demonstrated in the pouring rain, and marched from Plaza de Colón to Atocha, with cries such as "We were all on that train", "Spain united will never be defeated", "They are chickens without their guns," or "Murderers, murderers". The former Prime Minister José Maria Aznar began a campaign immediately after the attacks to convince the public, opinion-leaders and the media that ETA, who has claimed responsibility for more than 800 deaths since 1968, was behind the bombings and that it was the prime suspect. However, a video-tape released showed an Al Qaeda spokesperson claiming responsibility for the attacks. Since the bombings took place three days before a general election, they soon became the subject of political controversy. Opposition politicians and commentators urged the government to be clearer and more forthcoming about the information they had on the authors. In the afternoon of March 13, five suspects were arrested around Madrid in connection with the sale and falsification of a cell phone and pre-paid card found inside an unexploded backpack found at El Pozo station. Three of them were Moroccans, and two were Spaniards of Indian origin. The two Spaniards were picked up for questioning and were not formally arrested. They remained in custody the next day and were released two days later. The three Moroccans were identified as Jamal Zougam, 30; Mohamed Bekkali, 31, a mechanic; and Mohamed Chaoui, 34, a worker; all three of them were from northern Morocco. The two Indians were identified as Vinay Kohly and Suresh Kumar. Jamal Zougam had been listed as an Al Qaeda operative in Spanish judge Angel Acebes's 700-page indictment last fall of Osama bin Laden and others for the terrorist attacks on the United States on Sept. 11, 2001. Acebes told reporters that the three Moroccans, Zougam, Bekkali, and Chaoui were known to authorities because of past criminal records in Spain and that at least one may have been involved in a homicide. In March 14, the immediate political response of the Madrid bombings was the defeat of the Popular Party (P.P), and the coming to office of the Socialist Party (SP). The defeat of the P.P was widely attributed to anger among voters who accused the government of withholding information on the 3/11 investigation to save the election. Angry voters also accused the government of its military backing of the US-led war on Iraq. The opposition Spanish Socialist Workers' Party (PSOE), led by José Luis Rodriguez Zapatero, won a plurality of seats in Congress of Deputies, and was able to form a government with the support of minor parties. The day after the elections, the newly elected Prime Minister Zapatero announced his intention to form a minority PSOE government, without a coalition. Two minor left-wing parties, Republican Left of Catalonia and United Left, immediately declared they would support Zapatero's government. Zapatero also said that he would withdraw the 1,300 Spanish troops in Iraq by June on condition that the UN took control over Iraq. Claiming the withdrawal of the troops, Zapatero overturned the policy of close collaboration with the United States in the war on terrorism. Arrests of other suspects continued. The San Sebastián police also detained an Algerian named Ali Amrous who allegedly had talked about a terrorist attack in Madrid two months before it occurred. Five additional suspects were arrested on March 18 around Alcalá de Henares. Three of the suspects were identified as Moroccans Farid Oulad Ali, a construction worker, Abderrahim Zbakh and Saad Houssaini; a Spanish citizen was arrested in the Asturias region in northern Spain, for investigation of robbery of explosives; and a fifth as Mohamed El Hadi Chedadi, the brother of Said Chedadi, an alleged Al Qaeda operative arrested in 2001. One of those arrested was suspected of a major role in the attack and was also wanted over the Casablanca bombings. These attacks forced the European Union to call for an urgent meeting of the European interior ministers and security chiefs in order to look into ways to counter the wave of terrorist attacks. In Brussels, the EU ministers agreed on a new counter-terrorism coordinator to pull together the intelligence and security activities of the police and intelligence agencies to improve the sharing of information on known extremists. Morocco, which was also a target of Al Qaeda terrorist attacks in May 16 that killed 42 people and injured hundreds more, has been cooperating with countries concerned by the fight against terrorism, particularly with Spain before and after the attacks. Moroccan security experts went to Spain two days after the attacks to help in the investigation. These experts were members of a team that had already spent nearly a year working with Spanish officials on the investigation into Casablanca's terrorist attacks. Many Moroccans gathered outside the Spanish consulate in Tangiers and in other cities, waving banners against terrorism and chanting for peace. In the capital Rabat, leaders, including government ministers, and members of the Royal family, attended a special Mass in the Catholic Church to commemorate the dead, and express their solidarity with the Spanish. So far the investigation has focused on suspects from Morocco. Spanish police have 19 suspects in custody including Almorabit and El Gnaout. Among them are 11 Moroccans or Moroccan-born Spaniards, two Indians, two Spaniards and three Syrians. Fourteen of the suspects have been charged with mass murder or collaboration with or belonging to a terrorist group. Spain's Interior Ministry has identified the Al Qaeda-linked Moroccan Islamic Combatant Group as the prime suspect in the bombings. Investigators have also said they are working with foreign security services to track down other suspects, including Abdelkarim el Mejjati, the suspected operational leader of the Moroccan Islamic Combatant Group; Jamal Ahmidan, 33, identified as having rented the house where the Madrid bombs were prepared; brothers Mohamed Oulad Akcha, 28, and Rachid Oulad Akcha, 33, and Abdennabi Kounjaa, 28, who the documents say spent time in the house; and Said Berraj, 31, for an unspecified role in the attacks. Spain could have prevented these attacks. Moroccan officials said that Spain failed to act promptly on warnings about suspected Islamist extremists, including Jamal Zougam who left Morocco weeks before the Casablanca bombings. The lack of communication between the countries' security forces resulted from the tense relations under the leadership of Jose Maria Aznar. The new Socialist government is considered more conciliatory towards Moroccan concerns, and is expected to foster better relations with Morocco.